The Rockley Scholarship is now open and we need to receive your applications by email to nic@rockleyfarm.co.uk before midnight on Sunday 19th April 2015. Please make sure you read this post carefully and include in your application all the information we need. 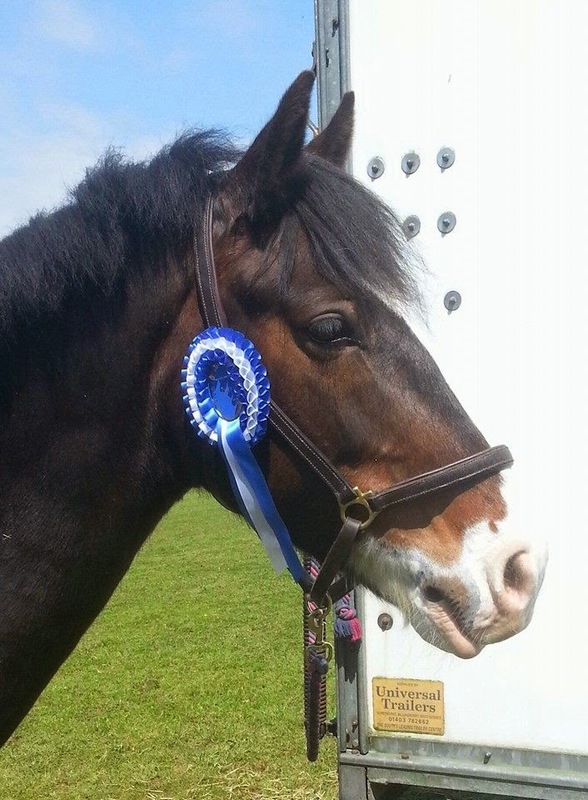 We will choose one owner and horse to be the scholarship winner and will notify the owner by Tuesday 5th May 2015; if you are selected you will need to be able to bring your horse to Rockley on or before 1st June 2015. Your horse's age is not particularly important - horses from 4-20 years old have all been through rehab. However, this type of rehabilitation is not suitable for horses who would be retired so the more information you can provide about your horse's potential and your ambitions the better. Rehab is aimed primarily at horses with a diagnosis of front limb lameness which is isolated by a palmar digital nerve block. 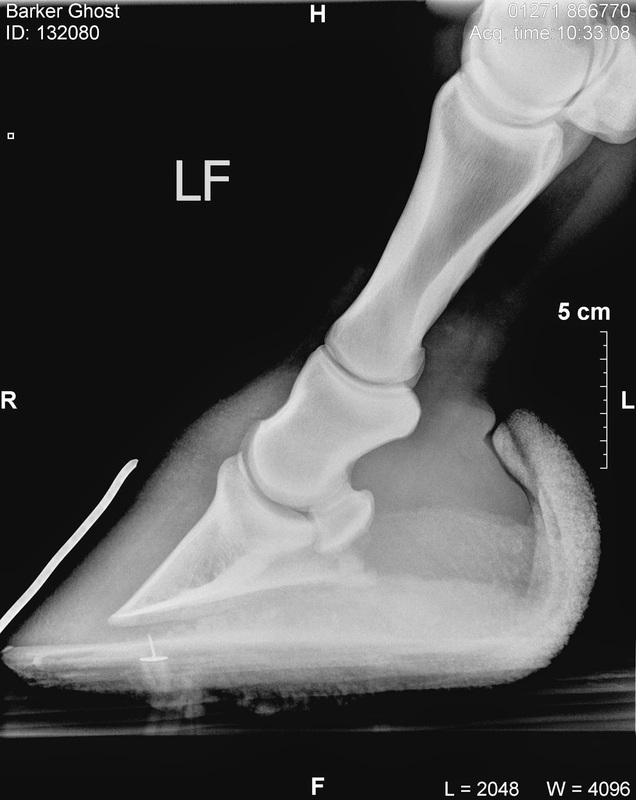 Typically horses have then had x-ray or MRI which identifies soft tissue damage such as DDFT/collateral/impar ligament injuries and/or navicular and coffin bone damage. You need to include a detailed history of your horse's lameness in your application and you will need a supporting reference from your vet. Your application needs to be supported by 2 references (you need to send these in with your application). One needs to come from your vet - who must provide details of the horse's veterinary history and give consent to the horse coming to Rockley. The other reference should be given by a professional in the equine field who knows you well and who has read and can support your application. This could be an instructor, yard owner, farrier or other equine professional. Please include contact details for both referees so we can get in touch with them. You need to include video footage of your horse with your application. Please upload footage to Vimeo or Youtube (in HD if possible) and include the links when you apply. We need: (1) footage of your horse in walk, on a flat hard surface. The camera should be held as still as possible and no higher than the horse's fetlock. 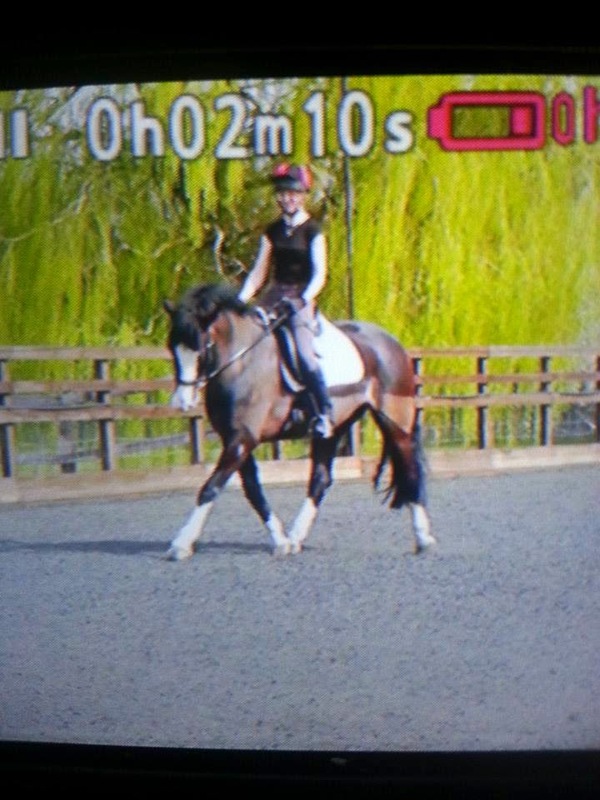 You will need a helper to walk the horse past; and (2) footage of your horse on a circle in walk and trot on both reins. There are examples of footage like this on the blog or on the Rockley Vimeo channel. The scholarship for your horse will be for 12 weeks and you will need to sign our usual rehabilitation livery agreement (please email us on the address above if you want a copy). There will be no charge for your horse's rehabilitation but you will need to contribute towards your horse's daily care, feed and livery. We will charge this at £75 per week simply to ensure that the scholarship winner is as committed as we are. You will need to arrange transport for your horse to and from Rockley. However Steve Leigh (Nature's Way Hoofcare) and Dawn Perkins have very kindly offered a total of £100 which would be payable towards transport costs. The scholarship is intended for someone who wouldn't otherwise be able to afford to send their horse here so please give details of why you think you are eligible in your application - for instance if your insurers have refused to pay for rehabilitation or you are on a low income. Keeping a horse barefoot is a long-term responsibility. We will provide feed information and details of appropriate rehabilitation exercise for when your horse comes home but in your application you need to explain how you plan to continue your horse's care after he comes home and what your aims are for the future. You don't need special facilities but do need to show that you have time and commitment. Don't forget to include your name, address, email address and a contact phone number so we can get back to you. For those not on Facebook, the Blinged-up Bullet Dodgers are a team of 3 ex-rehabs who went out competing at the weekend. They were competing as a team in a British Dressage Team Quest competition which featured 16 teams in all...AND THEY ONLY WENT AND WON!! The team consisted of Krista and Buddy, Emily and Indy and Lucy and Fryday and I couldn't be more proud. This is their team badge, along with a snazzy pistol motif modelled by Krista on FB and I am hoping for photos of them all bling-ed up in due course (I can't wait - they do it SO well!). 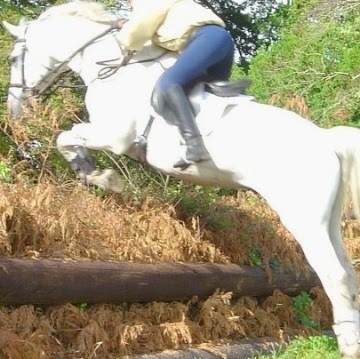 I'm always impressed and delighted when I hear of horses' successes once they go home - whether its a hard-won rosette or simply the first "proper" hack out - each achievement is its own mountain climbed. What is so special about this success is not just that they were all rehab horses but, even better, that it was an incredibly well-deserved team success. Each of these riders and their horses has worked incredibly hard to get where they are today. Each of them has suffered disappointments, set-backs and lots of frustration - along with some fabulous successes - as part of their journey and they have been there for each other and for many other owners every step of the way. At the time the photo above was taken, I don't think Emily or Lucy would have believed their horses would return to competition, but here they are. Along the way they have not only supported each other but have provided endless encouragement, help and wise words of advice to other owners; now they are inspiring those who are in the same boat that they were in a few years ago. I am so fortunate that nearly all the owners who come here are generous enough to give back - without complaint or agenda - to the "next generation": people whose horses have perhaps just been "written off", as Buddy, Indy and Fryday might have been if things had gone differently. Its probably the aspect of the RRR that I am most proud of: no matter what their discipline, from the most dedicated affiliated competitor to the most uncompetitive happy hacker - for everyone their horse comes first and they always have time and respect for other owners, no matter how different the ethos or interest or how they got to where they are today. "What a day! BD Debut and my pony did not let me down. Totally emotional that our team of three Rockley rehabs beat everyone else by a mile (1st of 16 teams), held the top score of the entire day (great job Emily and Indy) and I finally broke the 70% barrier!!!" "Spent the day with two fantastic ladies Krista and Emily and 3 fantastic horses for the inaugural outing of "blinged up bullet dodgers". And modesty aside, we smashed it. Beginner's luck? Who cares if it is. We performed (particularly emily and krista who nailed over 70% each) and more importantly we enjoyed it. Showing off our ponies who could very easily not be with us. Kapow." "The most amazing day- despite the rain. A win for Indy and I at BD .... still can't quite believe it. As if it could get any better.... it did- a win for our Team Quest of barefoot rehabs. Legendary behaviour all round"
"You make your own luck as they say. None of us felt very "lucky" 2 years ago. This spring will see the return of the Rockley scholarship and I will be posting full details here very soon but I wanted to give you a heads up straightaway. Rockley has become steadily busier and busier over the last few years. We are full and have a waiting list pretty much year round; as one horse goes home, another is usually on a lorry on the way here ready to take that place. 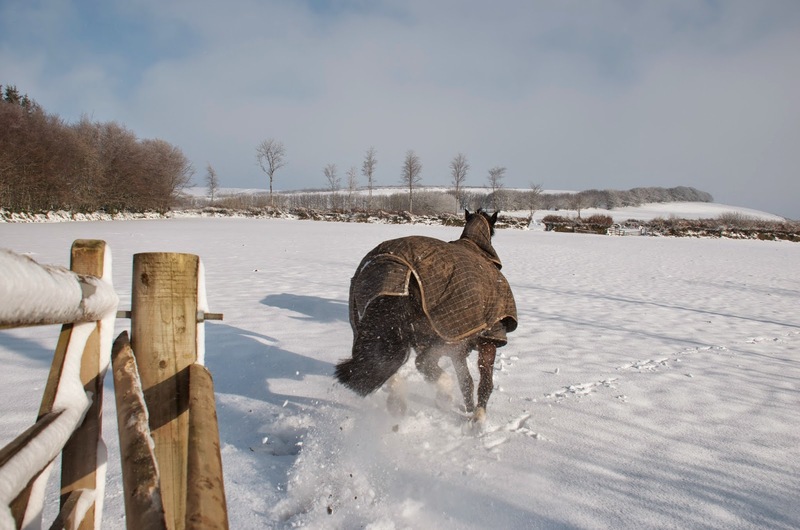 Its wonderful to have so many horses and owners coming to us but I am aware that there are owners who aren't able to send their horses here, however much they or their vets might want to. This post is for them and is also my way of trying to say thank you to all of you who have supported us over the years. Basically, the scholarship is a way of giving one owner the chance to send their horse here for rehab for a much reduced charge. The aim, of course, is to give an opportunity to someone who wouldn't otherwise be able to afford it. We will be offering the rehabilitation completely free but will be asking for contribution towards livery costs - this is just a way of ensuring that whoever has the scholarship is as committed to the process as we are! As usual, veterinary consent will be a prerequisite and the scholarship will only be open to horses who have a navicular or DDFT related lameness. I will be posting full details, including all you need to know about dates and how to apply, within the next fortnight so please hang fire till you've seen and read that post! There is no better way to assess a hoof than to see it in action. For me its impossible to judge a static hoof because its only when its loaded and moving that you can tell whether its balanced and functioning as well as it can. 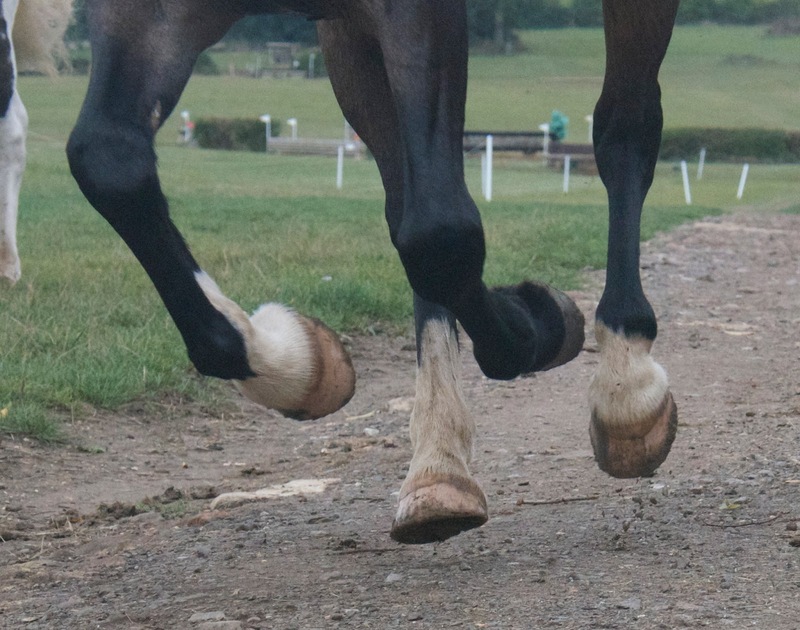 Of course, once you have seen a horse's movement you probably have a pretty good clue about what might (or might not) be wrong with his feet but it should always be that way around. Its actually quite dangerous to pre-judge a hoof by its appearance alone. Have a look at this comparative footage, for instance, taken 3 and a half months apart. You can tell from the stills that the foot is healthier now (below) as compared to in November (above); the landing is more established and confident and the stride length is better - so you'd expect to see improvements in the back of the foot. Sure enough, comparing the hoof photos there is the confirmation. Someone asked last week for a critique of good and bad hooves - and for the reasons above I would be reluctant to critique any hoof on the basis of photos alone. Using the footage to demonstrate improved movement, though, you can see that the foot today (above) has a healthier frog, less contracted heels and the sole is more symmetrical - which indicates better media-lateral balance. Deeper collateral grooves and better concavity are outward signs of better sole depth and a stronger hoof capsule. 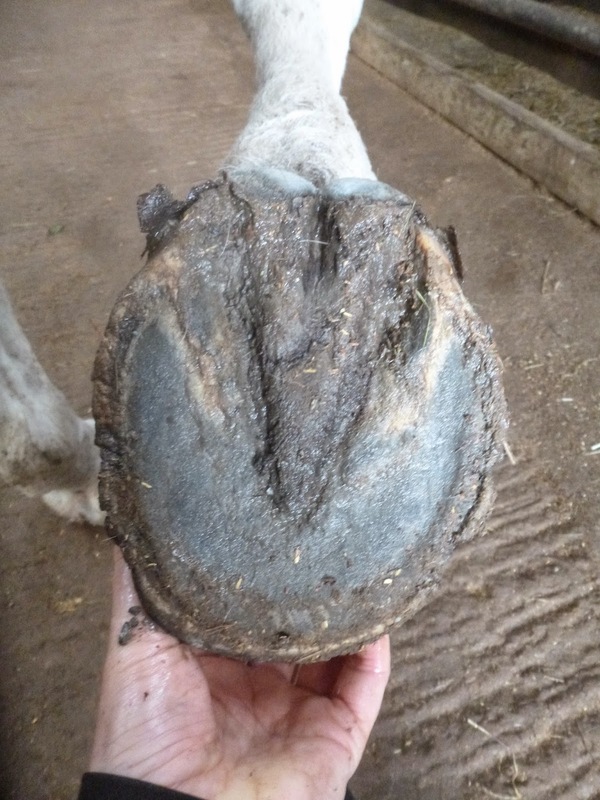 This foot is only just over halfway growing in a stronger hoof so there is still more improvement to come. In the upper photo the horizontal mark is immediately below the hairline. Today its just over halfway down the hoof and the profile both of the hairline and the back of foot is improved. 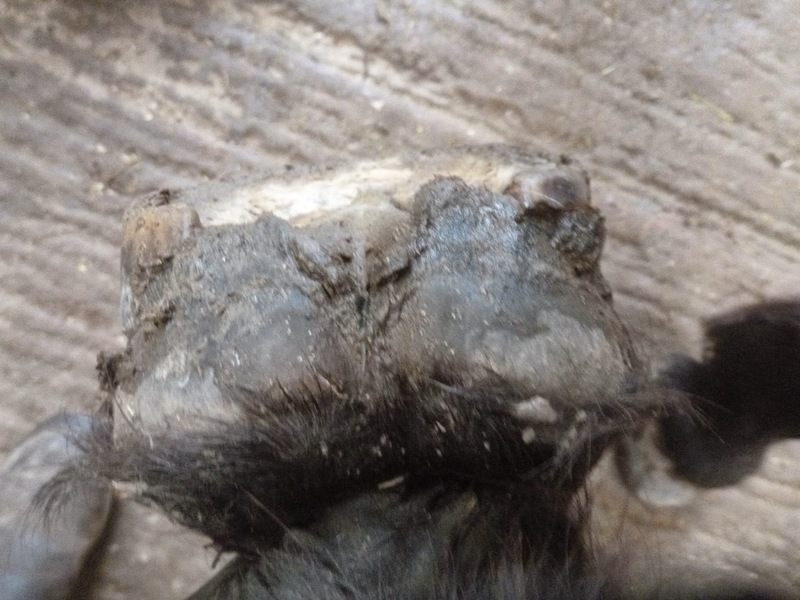 Once the new growth is all the way down the toe will be shorter and the entire hoof more supportive. These feet belong to new boy Ennis who arrived on Monday. He has one of the most splendid names I have ever come across and his feet aren't too shabby either though his palmar hoof his weak. He has been shod up until a couple of months ago and his shoes were taken off when he had his MRI. He still has a relatively poor frog but much less contraction than we often see. He has been diagnosed with bilateral DDFT lesions and navicular bone damage and is not surprisingly landing flat/toe first in front. This isn't a bad foot but when you look at the photo below you can see that he has an interesting conformation issue on this leg. The frog on this foot is better but the medio-lateral balance is worse than on his LF so I would expect some changes to this foot as well. The last word in my "how to take your horse barefoot" series (which consists of the "Living in the Dark Ages" post, Monday's post on nutrition and yesterday's post on getting hooves working) goes to a subject I've often talked about before - trimming. "When you condition the horse, you condition it with exercise, not with trimming. 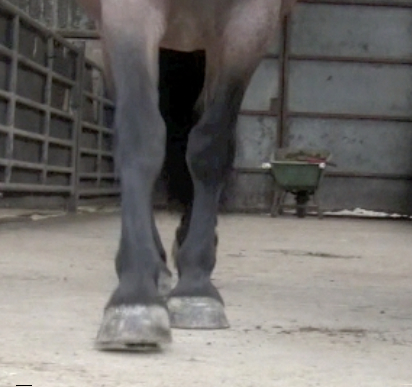 A good barefoot form to the hoof is only the outward sign that it is functionally right. But it tells you little about the inner toughness of the hoof. You can’t trim the hoof into toughness. You have to work, to ride the hoof into condition." 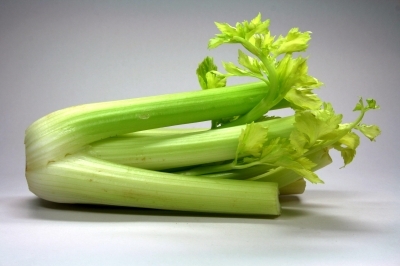 I've blogged often and at length about trimming, so have a search (try the term "celery"!) if you'd like more detail, but I wanted to finish this week just with a few bullet points about trimming. A trim can no more improve the health of a hoof than a haircut can improve the health of your hair - health comes from within. A trim can only remove structure, never rebuild - for the latter you have to look at nutrition and exercise. A trim can radically alter load on a limb and change foot balance - sometimes to the detriment of the horse's soundness. A trim will artificially simulate and stimulate wear (causing you to think your horse "needs" a trim every few weeks!) but is unlikely to mirror natural wear patterns. A trim is frequently (in my experience usually) neither necessary nor beneficial to a horse either in consistent work or kept on consistent surfaces. I started off by looking at why shoeing horses became popular and why - for me - its a relic of the dark ages and something we and our horses are better off leaving in the history books. On Monday I was talking about the cornerstone of healthy hooves - nutrition and why its critical to get this right before you start working your horse. Today I want to cover some of the essentials to consider when you start working your horse. 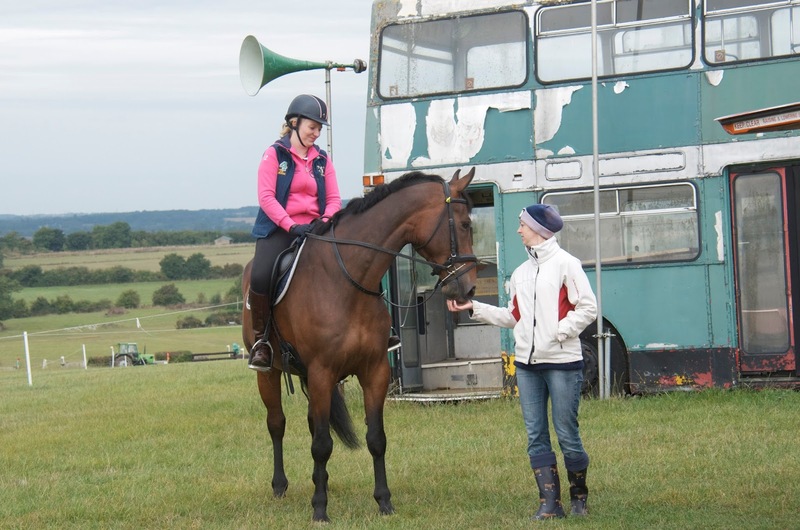 However I must make one thing clear straightaway: this blog post is talking about horses who are already sound and have no pre-existing injuries. 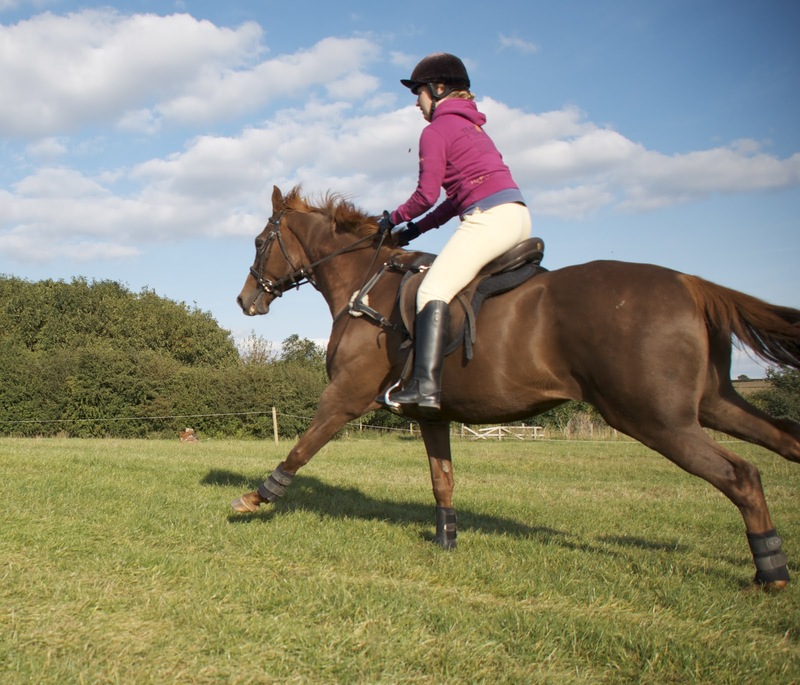 Horses who are recovering from lameness or trauma are a whole different ball-game and need careful - and individual - handling or you run the risk of aggravating or worsening the problem. Does he have a balanced foot? 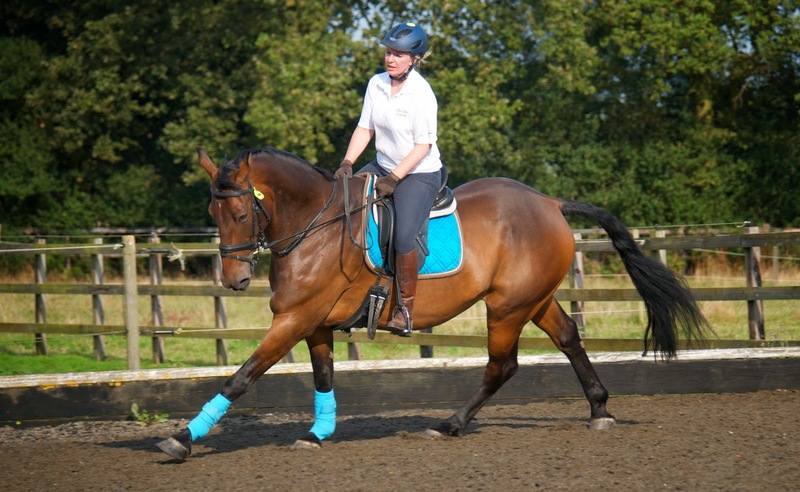 Before you work your horse you need to be sure his feet are balanced and capable of supporting his limb as he moves. There are 2 main things to look for. Your horse should typically land heel first in walk on a flat hard surface. Your horse should load both front feet evenly (a fractional lateral first touchdown is acceptable), so rather than landing on one heel and tipping, both heels should touch down at the same time. 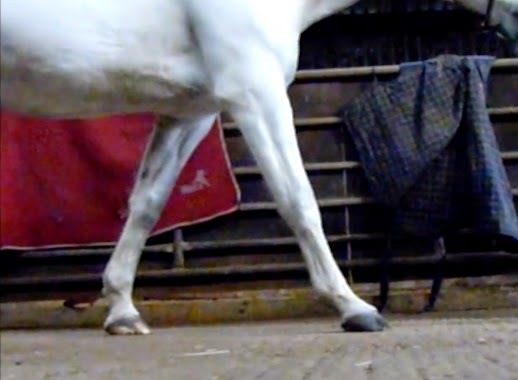 Both of these are easy to spot once you get your eye in but if you are not used to assessing movement then filming your horse and slowing it down can be helpful. 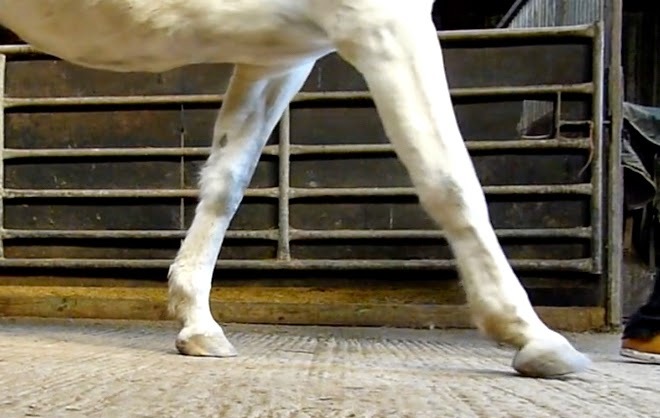 To do this you need the camera held as still as possible and level with the horse's fetlock while the horse is walked past or towards the camera (there are plenty of examples elsewhere on this blog!). If your horse is on a good diet, has a balanced foot and is sound then working barefoot should only strengthen his hooves and improve his movement and that's where the next important step comes in. 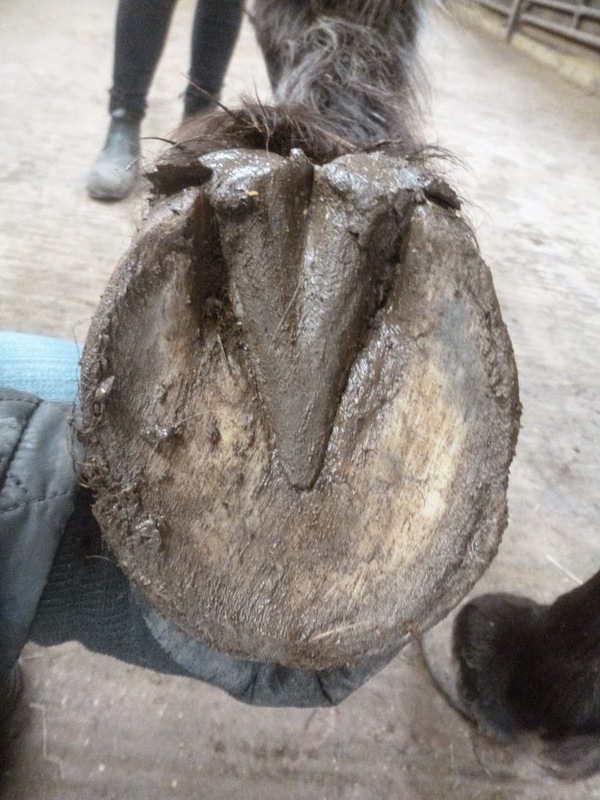 If you have a shod horse and are used to your responsibility for his feet being confined to booking the farrier every few weeks it can be intimidating to understand just how much responsibility you as an owner have for your horse's hoof health once barefoot. 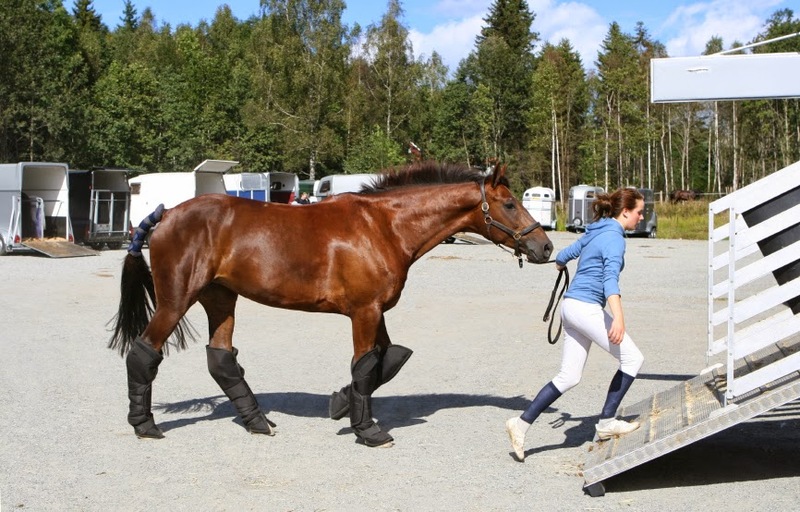 A horse with healthy feet is capable of awesome amounts of work without shoes. 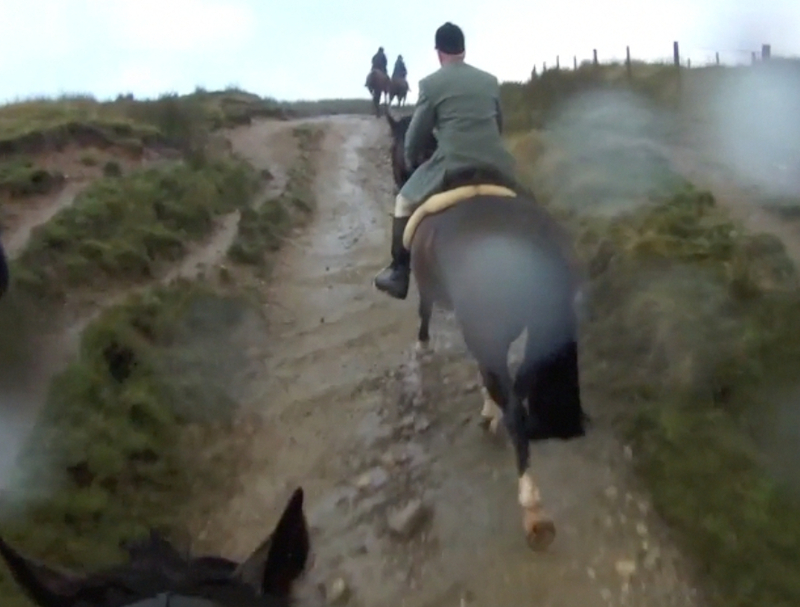 Our own horses hunt twice a week over a 9 month season on some very difficult terrain - the oldest have been doing so for 11 seasons barefoot and are still going strong. The key point here is that feet have to be healthy. In horses, feet are a magnifying glass for health and health problems will often show up in the feet first; this can be foot pain over tougher surfaces, flat feet and loss of hoof integrity and, in extreme cases, problems like laminitis or tendon and ligament damage. As well as needing to be healthy, feet need to be fit. 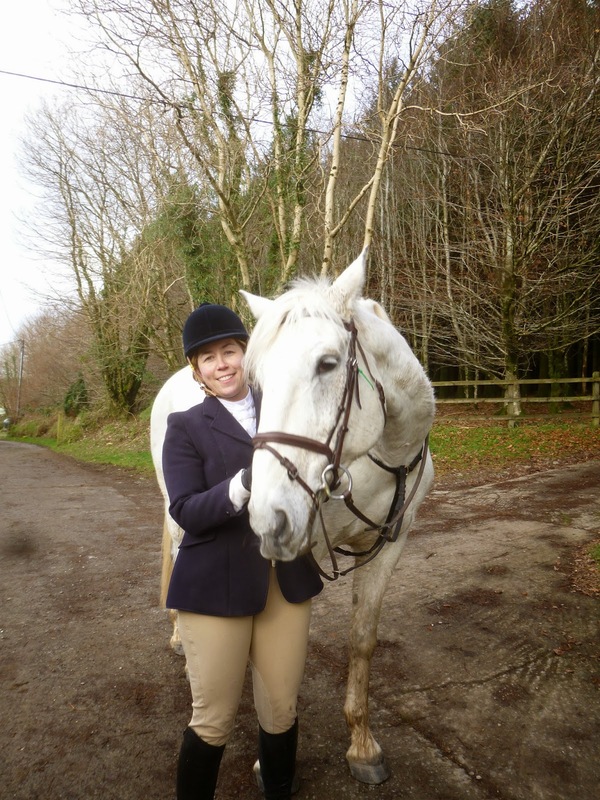 You wouldn't dream of taking an unfit horse out of a field and riding it for hours with no preparation (at least I am sure this is true of anyone reading this blog!). 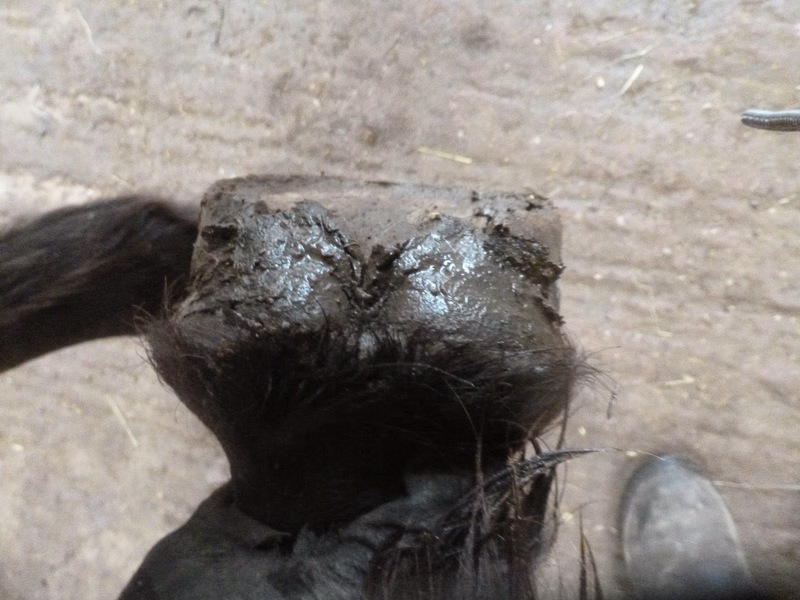 By the same token, you should expect a horse's feet to need fittening for the work you regularly do, especially if he has been in shoes or out of work. If you build up and reduce work levels steadily and consistently you give hooves the best chance of adapting their growth rates to the mileage and terrain they are covering. For instance, although many people instinctively feel that hooves grow faster in the summer, my own horses grow the most hoof during the hunting season - the autumn and winter when they are doing the highest mileage. Terrain, as well as mileage, plays its part. Just as a runner from a flat part of the UK would struggle with fell-running, hooves which are only used to an arena or soft field need time and work to adapt to more challenging surfaces like stony tracks and roads. There is no reason why a healthy hoof can't cope with extended mileage over this sort of terrain but - as with hill work or fast work - you introduce it gradually and increase it steadily. 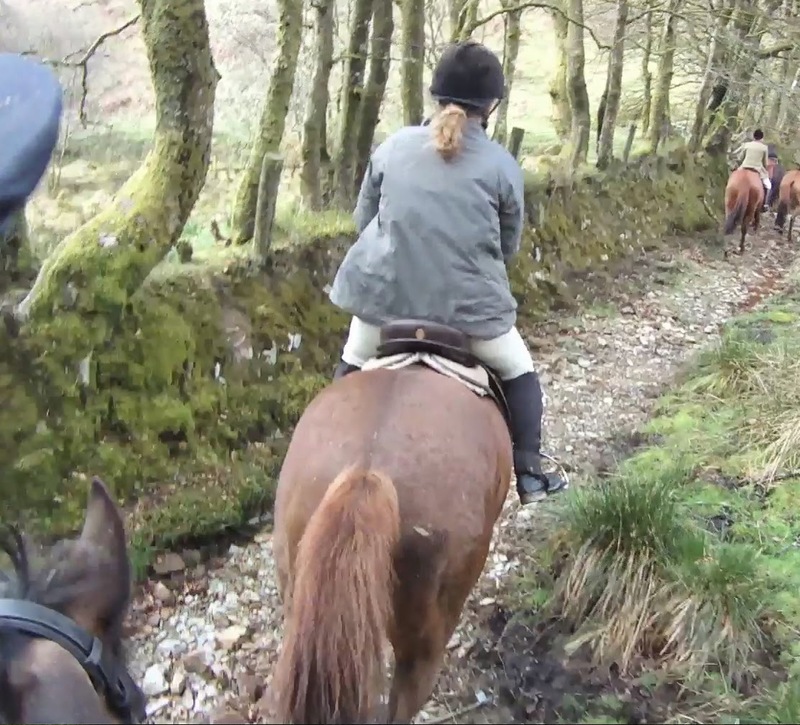 Our 2 year old comes out on the roads led from another horse but - although he has great feet - he doesn't do the same mileage as the older horses (in the wild he would, of course - its not his feet which are the limiting factor but our time constraints!). As he gets older and does more his feet will develop and strengthen, just like the rest of his body, and by the time he is ready for ridden work he should have feet which are as rock-crunching as our other horses. Consistent work will keep them that way and once a hoof is strong and well-balanced there are few limits on what they can achieve. Sorry I promised you a post on Tuesday - its taking longer than I expected and WILL be up soon but I'd better get it done properly as its all about exercise, biomechanics and foot balance so its not a 5 minute job! So you want to find a better way? Many thanks to all of you who gave such great feedback following my mammoth post last week - Living in the dark ages? It was certainly a popular post (apparently its reached over 15,000 people via Facebook alone!) and it was fun to post something which I've been wanting to say for a while. Quite a few of you have asked since then for some advice on how to go about taking a horse barefoot so I thought the easiest way to put the information in one place was another post. Its a huge topic and I thought it was worth spending a whole week's blog posts on it so lets make a start. First off, today's blog is all about nutrition. 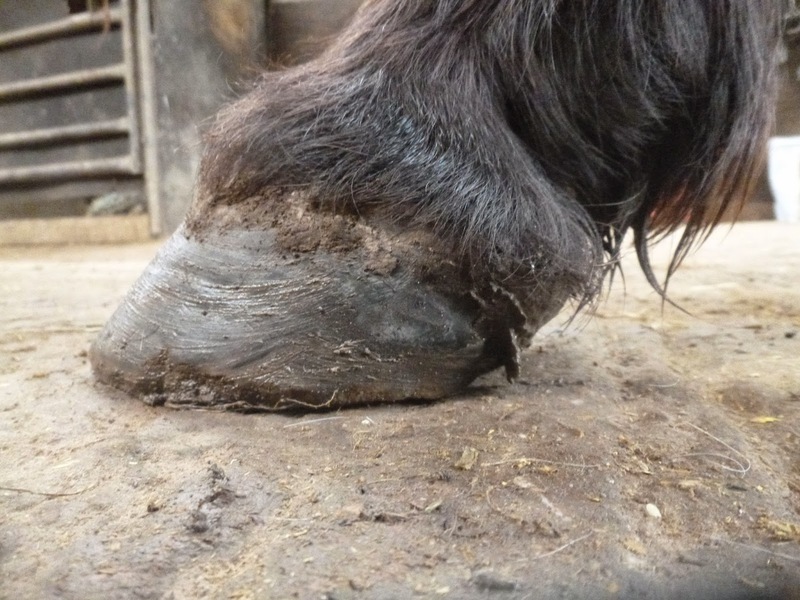 Its the foundation for hoof health and of course is equally important if your horse is shod. 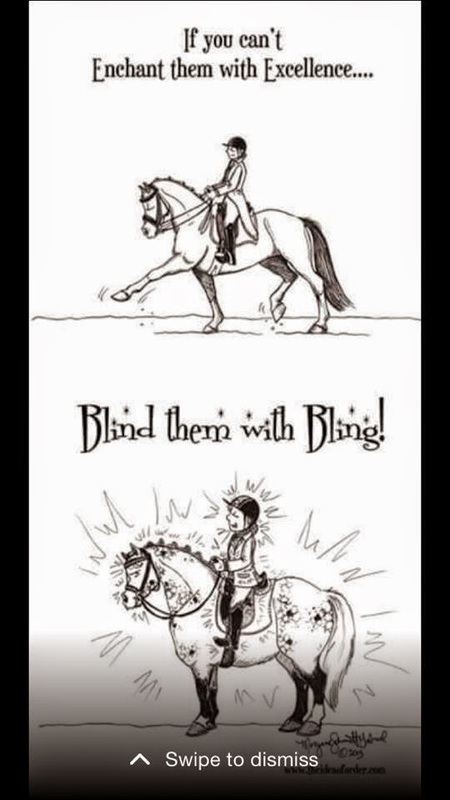 However with a barefoot horse nutrition is everything - you absolutely have to get it right. Without appropriate nutrition no horse can have healthy feet and without healthy feet a horse will struggle to work hard especially on tough terrain. Its my experience that every horse who is uncomfortable out of shoes has a nutritional problem rather than a "foot" problem. Its therefore worth going through your horse's diet with a fine tooth comb well before you want to work him barefoot - at least 2-3 months is sensible and longer if possible. The basic rules for hoof health are fairly simple - low sugar, low starch, high fibre and adequate minerals. Low sugar/low starch doesn't just apply to your bucket feed but everything your horse eats - and most of that is forage. 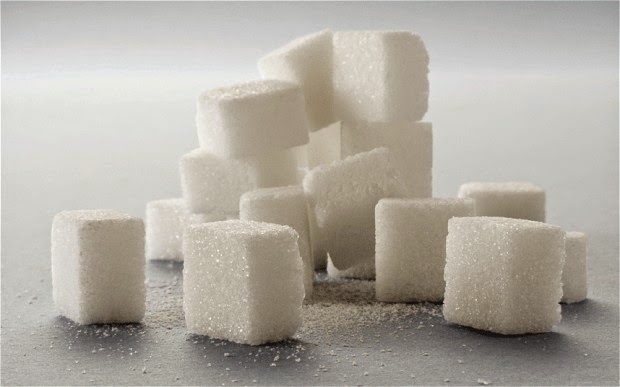 You need to be aware of sugar levels in grass (which fluctuates wildly through the seasons and can be dangerously high at some times of year) and also that some types of grass - like ryegrass - will always have higher sugar levels than others. 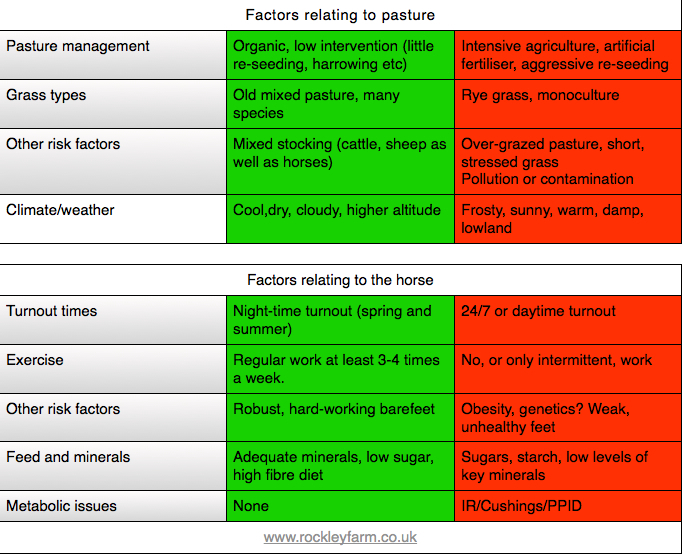 Unless you are on incredibly safe grazing or have a very resilient horse you are likely to have to restrict grazing during high risk periods. This isn't terribly difficult (on hot days during spring and summer often horses prefer to be in and away from the flies) but it does make more work than just chucking a horse in a field and it does entail feeding lower sugar forage - hay or haylage - as a replacement. Minerals are the next essential. Most UK forage is low in key minerals which are crucial for hoof health (copper, zinc, selenium and magnesium) so most of us need to provide supplements. A forage analysis gives you a detailed picture of what is - or isn't - in your forage but many horses do well on an off-the-shelf supplement and that's an easier place to start. However, please don't feed your horse a standard balancer and expect his feet to improve. Many contain sugary bases to make them palatable and there are a few - very popular - balancers which are notorious for making horses footsore. As if that wasn't bad enough, most don't even contain adequate levels of the necessary minerals, making them worse than useless. Fortunately there are supplements available which not only provide the right levels of minerals but also no nasty additives. The downside is that they aren't as palatable but - like toddlers - horses get used to them if they are introduced gradually and if sugary alternatives are no longer offered. There are very few supplements which I am happy to recommend. Progressive Earth sell a range of great supplements and either Pro Hoof or Pro Balance are suitable as an all round mineral supplement. They are a great company to deal with and have a fantastic reputation for customer care as well! Alternatively Equivita is another supplement with good levels of key minerals and no unsuitable ingredients. If your horse is a good doer and not in hard work then forage and minerals may be all he needs but if you need to add extra calories or protein then - you've guessed it - its not as easy as just reaching for a big bag of pony nuts. I haven't got time to go into all the dos and don'ts - there is a whole chapter on feeding in "Feet First" after all! - but oats and unmollassed sugar beet are safe, readily available and enjoyed by most horses. Micronised linseed and copra meal are higher in oil (for slow-release energy) and are also safe for feet and very palatable so perfect for horses in really hard work or who are lacking condition. 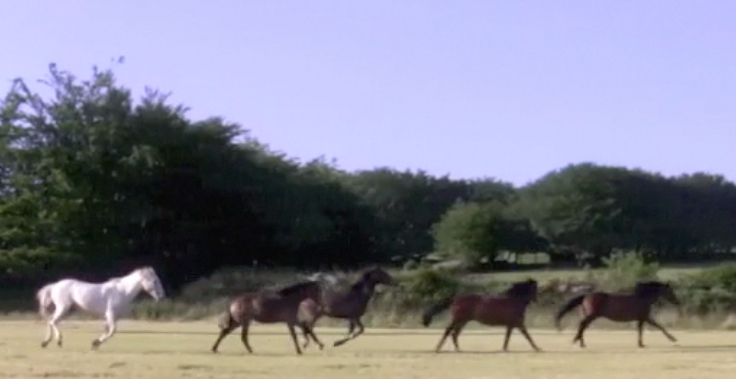 I'll blog tomorrow about getting horses working barefoot! Horses and their owners today are incredibly fortunate in so many ways. 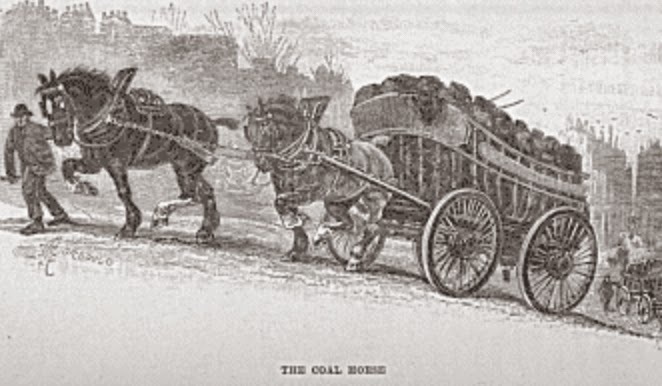 Our horses are not kept in the harsh conditions which are the norm for working animals and their lives as a result are much longer (a typical working horse in Victorian London began work aged 4 or 5 and would only "last" for 4-6 years). Today, even a really "hard-working" horse in the UK is likely to be exercised only for a few hours per day, with plenty of time off, and we expect our horses to be fit and healthy well into their teens and (increasingly) twenties. We have access to research on behaviour, biomechanics, exercise, nutrition and disease. Most owners take the opportunity to educate themselves about their horses using the huge amount of information available to us and most strive to ensure their horses' needs are fulfilled. We can harvest and preserve high quality forage and we have the ability to analyse the nutritional quality of the food our horses eat, feed a bio-appropriate diet and supplement their feed to ensure optimal health. Horses are typically treated as athletes not workhorses (though arguably we sometimes forget that even the greatest equine athlete is first and foremost a horse). Horses today can have massage, physiotherapy, hydrotherapy; they can work on treadmills and walkers and compete on arenas with surfaces designed specifically for a particular discipline. 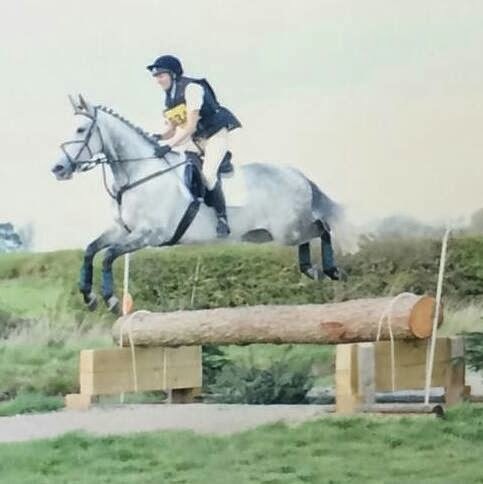 Top horses are regularly flown round the world and even a family pony or bog-standard hunter may well have a lorry or trailer designed for his comfortable travel along with a wealth of related equipment. 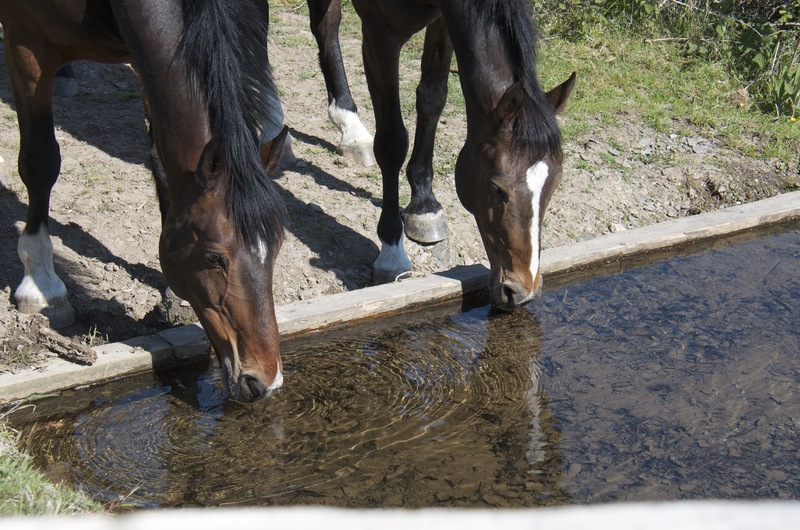 To a large extent we can and do manage our horses' environments to suit both them and us. Girths and bridles can be ergonomically designed; saddles can be pressure-tested; rugs are made of breathable, lightweight fabrics. Buildings are designed to be well-ventilated with good lighting and even heated wash-down areas. We vaccinate our horses against tetanus and ensure they are free of parasites. And when things go wrong there is sophisticated veterinary diagnosis available, perhaps using MRI, ultrasound, scopes and x-rays, with the option of surgery and rehabilitation to give the horse the best chance of recovery. Nowadays nearly all of us can take good quality slow-motion footage using our phones and as we work our horses, train them, have lessons or compete we have the ability to use video and photos to highlight problem areas and improve both ourselves and our horses. Don't misunderstand me - I am well aware that shoes are a useful way of allowing an unhealthy hoof to over-perform. In my opinion that is the deciding factor which ensures the continuing popularity of horseshoes. 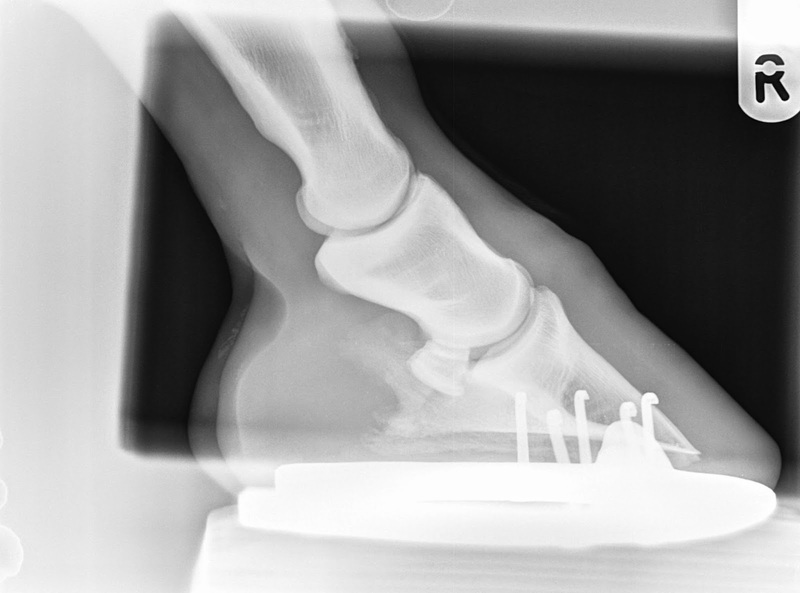 If you have a horse with unhealthy hooves you can enable those hooves to become healthier by addressing the horse's diet and biomechanics but this takes time and effort. By contrast, the single quickest way to achieve a higher level of performance - more miles, tougher terrain - than unhealthy hooves are currently capable of is to put a set of shoes on. Like every quick fix, shoes have a number of disadvantages. Recalling my time with shod horses these include a heightened risk of injury (to horse and owner), loss of integrity in the palmar hoof, diminished proprioception and (frequently) impaired biomechanics. Shoeing is fast, though - certainly faster than growing a healthier hoof - and, as in Victorian London, you can use shoes when you have no means of improving the health of the hoof. Shoes therefore made perfect sense for working horses in Victorian London and before. These horses were required to work for 10-14 hours per day, 6 days a week and could regularly cover 40 miles per day*. 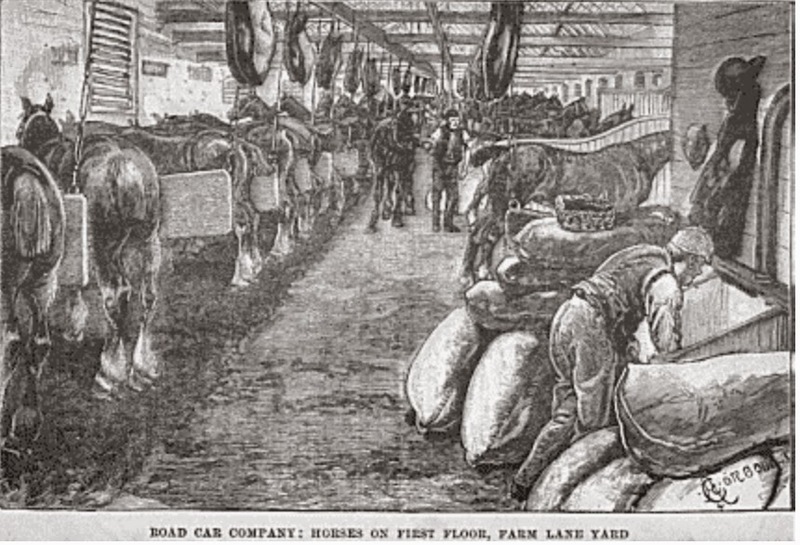 City horses were kept confined in stalls when they weren't working and outside the air was polluted. Their forage was often dusty and of poor quality and of course there was no way of analysing what might be missing from feed. The long periods of work with no forage can't have done them much good either. Horses were almost bound to suffer nutritional deficiencies not to mention respiratory and metabolic challenges (all of which can, as we now know, affect hooves). In the circumstances, shoes were an effective way of ensuring that each horse could work for a few short years, regardless of the health of its feet, its management or the state of the roads. But technology has moved on (at least in most other areas) and practices that were acceptable in the 19th century are often outdated, unnecessary and primitive today. We are so used to shoes that its sometimes hard to see beyond them (I've blogged about this before too because even veterinary academics have this particular blind-spot!) 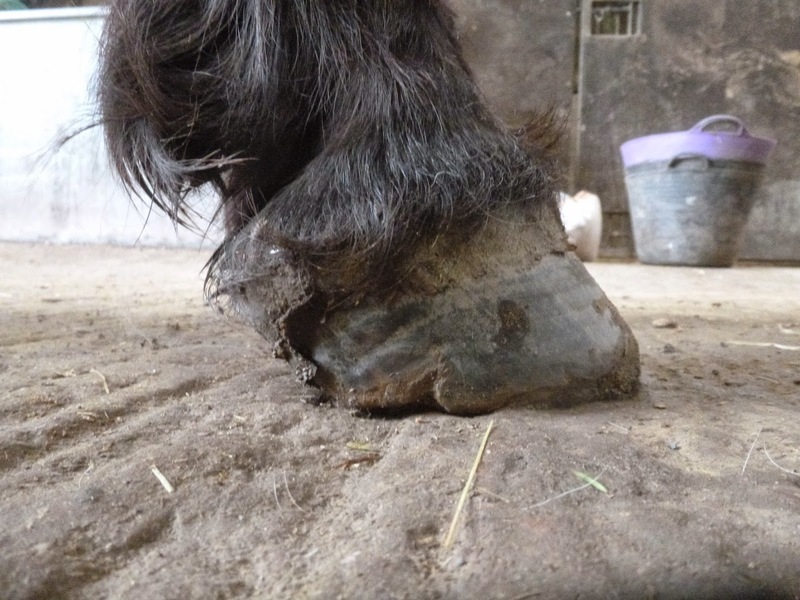 but, as Steve Leigh said to me yesterday, can you imagine what the outcry from welfare groups, let alone vets, would be today if someone proposed, out of the blue, nailing a metal shoe onto a horse's hoof? 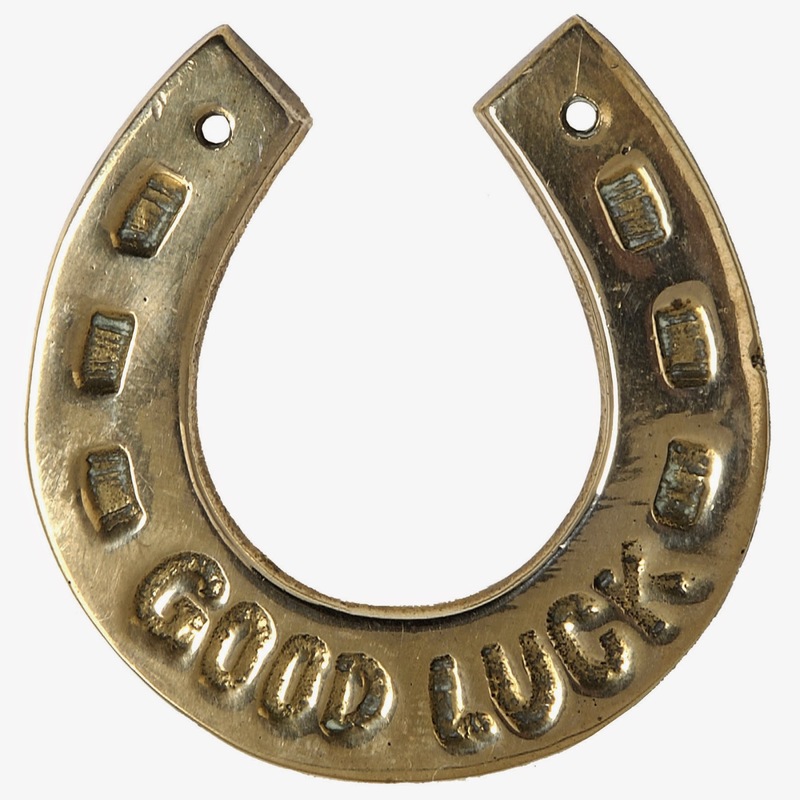 In an era when the health and performance of our horses is everything, why do so many of us cling to a shaped piece of metal as a talisman for soundness? In an era when we prefer science and evidence to tradition and hearsay (or like to think we do), what is the reason for this superstitious behaviour? Its not because shoes are a technological solution, that's for sure. Proponents of shoes will argue that there is little research on the performance of horses without shoes. To be honest, there is little research on the performance of shod horses either and certainly none which rigorously compares long-term performance between horses who are working shod and barefoot in the same disciplines (which is the evidence we need). So, if we are short of research, what do we have? 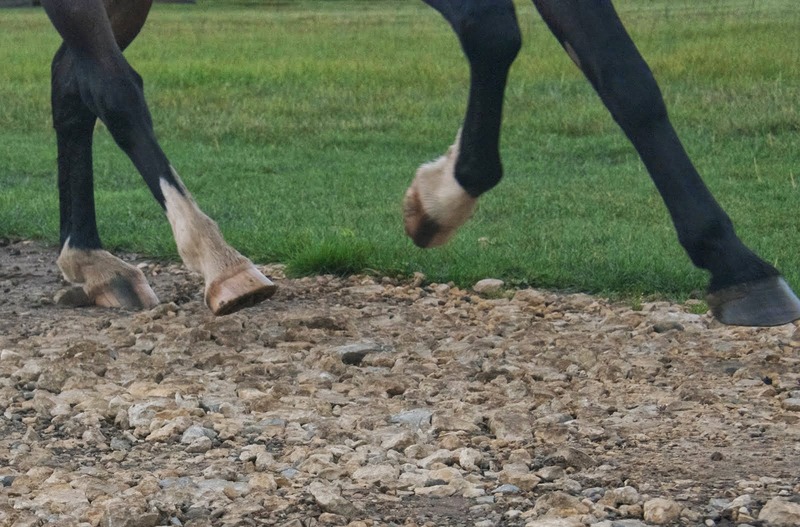 My experience, and that of most owners of hard-working barefoot horses, is that hooves are sounder and as a rule function more effectively without shoes. 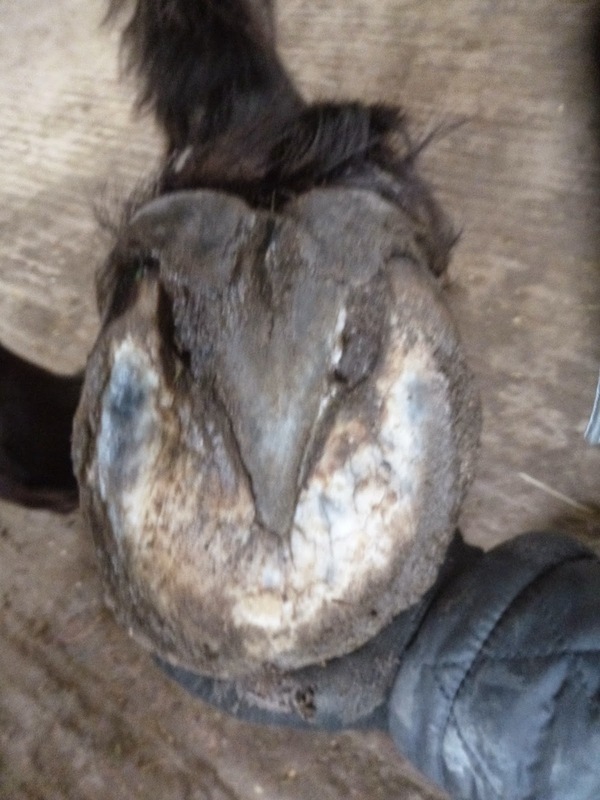 I have also seen an awful lot of horses which have previously been shod and had serious lameness issues but which have returned to full work barefoot. 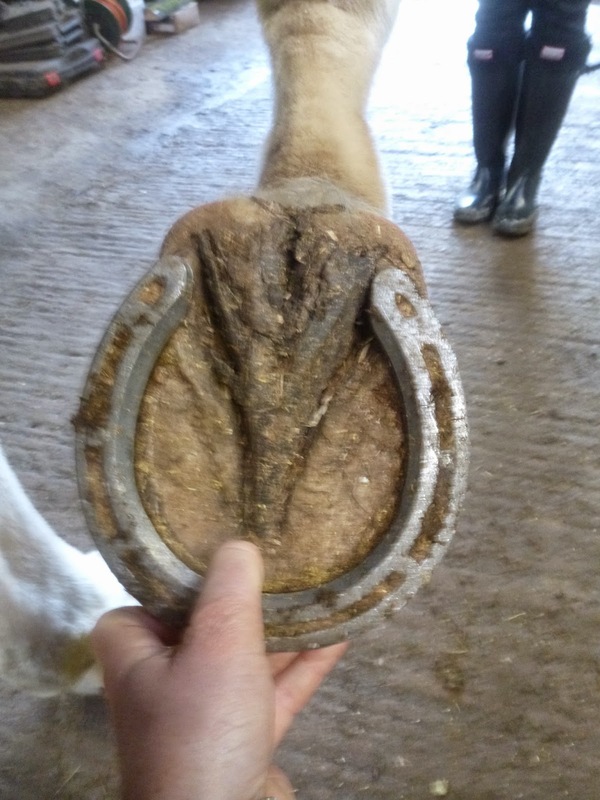 Of course, the owners of these horses wouldn't dream of shoeing them again (I wouldn't dream of shoeing any of my own horses either) because we have seen that our horses have healthier feet without shoes. 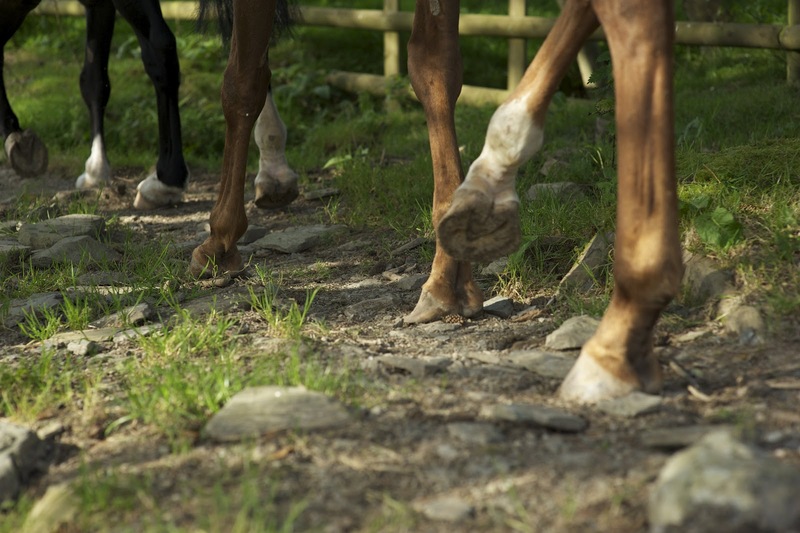 Interestingly, almost all owners of barefoot horses have extensive experience of working shod horses. By contrast, very few owners of shod horses have extensive experience of working barefoot horses. 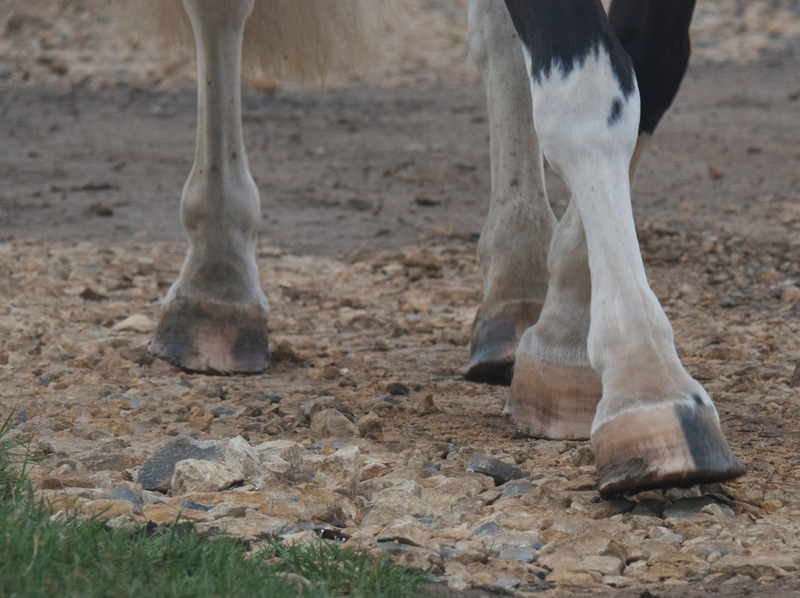 Those of us with barefoot horses have seen with our own eyes the high levels of performance healthy hooves are capable of - seeing is believing, especially as most of our horses had serious soundness problems when shod. Shoeing remains a quick, if invasive, way to enhance the performance of a poor foot but it is ill-researched, carries the risk of injury and even the physiological effects aren't clearly understood. Of course you can continue to use shoes if that's your preference and if you plan to work your horse 12 hours a day, 6 days a week, 40 miles per day I'd say its advisable (and you should start saving for a new horse now as well). However, if you aren't tempted by a quick fix and would rather take the option of improving the health of your horse, starting with his feet, then congratulate yourself that you live in an era when its actually possible and start doing something about it! 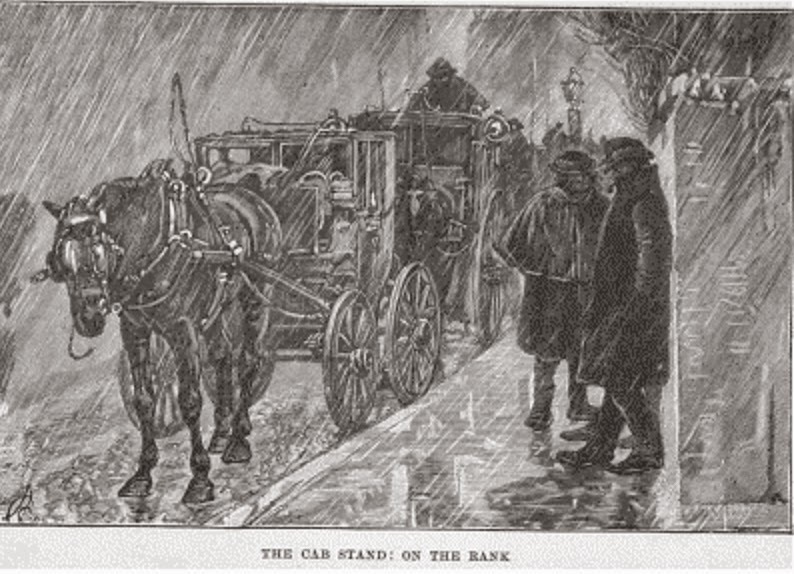 *www.victorianlondon.org contains excerpts from The Horse World of London (W. J. Gordon, 1893) which provides a fascinating and sometimes horrifying glimpse into the lives of working horses. It used to be the custom to turn out all types of working horses for a few months during the summer without shoes. This not only gave them a rest and improved their general condition but gave their hooves a chance to grow without being damaged by nails...If your horse is used less at a particular time in the year then consider whether giving it a holiday without shoes might benefit the horse and the feet."